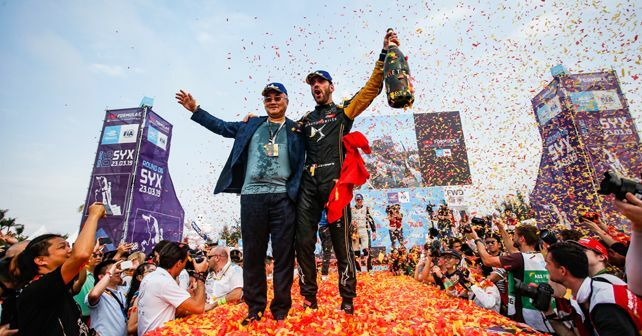 After point-less finishes in the previous three rounds, DS Techeetah's Vergne pulls one out of the hat in China; Mahindra Racing manage a dual point-scoring finish in the sixth round of the championship. After what seemed to be a promising start to the 2018-19 season for defending champion Jean-Eric Vergne (DS Techeetah), things quickly seemed to be slipping out of the Techeetah driver's hands as he managed a DNF in Round 3, followed by no-point finishes in the subsequent two rounds. However, he found his mojo back this weekend as he started the race from P2 and clinched his first victory of the season. Behind him, pole-sitter Oliver Rowland (Nissan e.dams) finished in second and Antonio Felix da Costa (BMW i Andretti Motorsport) maintained his starting position to finish the race in third. Starting from pole, Rowland managed to keep his lead for quite a while with Vergne chasing him in second and da Costa in third. However, within the opening minutes of the race, the first incident of the race came into play involving a crash between Sam Bird (Envision Virgin Racing) and Stoffel Vandoorne (HWA Racelab). While Bird's race came to an immediate end after going off the track at Turn 5, Vandoorne eventually returned to the pits as well, citing beyond-repairable levels damage on his car. Both of them also came under investigation for causing a collision. Up front, eager to claim his first win, Vergne challenged race leader Rowland as he made an overtaking move at Turn 11, successfully managing to come into the lead. However, Vergne's new-found lead came under pressure as Alexander Sims' retirement caused the race to be red-flagged. Consequently, the clock was stopped with 12 minutes left while Sims' BMW was salvaged. However, despite the restart, Vergne managed to pull away from the pack. But, the win wouldn't come to him easily as in the final moments leading up to the chequered flag, Vergne came under investigation for not following the Safety Car procedure properly. However, he was let off the hook soon after. Behind the top-three finishers, Vergne's teammate Andre Lotterer was able to convert his seventh-place start into a fourth-place finish, followed by Audi Sport ABT Schaeffler's Daniel Abt in fifth. Sebastien Buemi (Nissan e.dams), who had started the race from sixth, managed to ruin the proceedings for Robin Frijns (Envision Virgin Racing) and Lucas di Grassi (Audi sport ABT Schaeffler) as Buemi made contact with Frijns on Turn 7, sending the Virgin Racing driver into a spin and into the back of di Grassi. With di Grassi stranded, the race ended under a Full-Course Yellow (FCY). While Buemi managed to finish the race in eighth, ahead of him, the Mahindra Racing duo ran an incident-free race to earn some crucial points, with Jerome d'Ambrosio and Pascal Wehrlein taking the sixth and seventh spots, respectively. After the sixth round, da Costa sits on top of the leaderboard with 62 points, ahead of Mahindra's d'Ambrosio by just one point. Behind him, Vergne and Bird are both tied for the third spot with 54 points each.